There is a plethora of automotive-inspired watches available, and many are from brands with a long-standing history in motor sport. 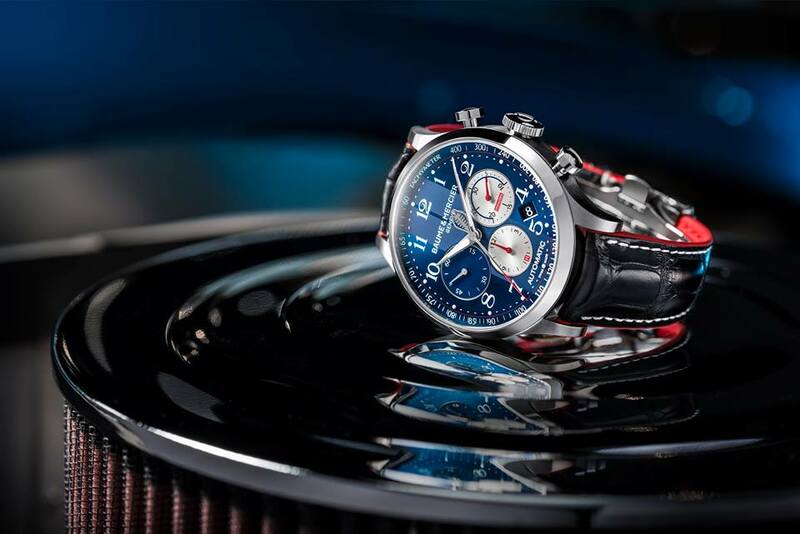 This however, is an interesting first, a link-up between Baume & Mercier and Vegas-based Shelby American, namely due to the fact that until now Baume Mercier hasnt yet made a drivers watch, and because Shelby American hasn’t partnered up in this way before. The official reason for the collaboration is that 2015 marks 50 years since tuning ace Carroll Shelby’s Cobra Daytona coupes won the World Manufacturer’s GT Championship. It was the first, and still only, time the championship has gone to a team of American-built cars. Carroll Shelby was a successful Le Mans-winning race car driver and master tuner. He had to give up competing in 1959 at the age of 36 due to a long-standing heart problem. After retiring from driving he set up a driving school and founded Shelby American which, in 1962, began importing British-built AC Ace sports cars and fitting them with large-capacity V8 Ford engines. 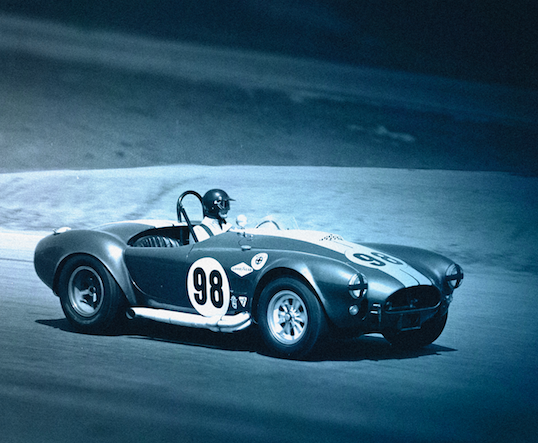 The car that was born of this marriage we know today as thee AC Shelby Cobra. One of the most collectible cars of all time. To celebrate the 50th anniversary of the GT Championship win, Baume & Mercier has created two watches inspired by the mighty Cobras, both of which are based on the familiar Capeland chronograph. The two models are 44mm chronographs powered by a modified Valjoux 7750 automatic movement. Like other models in the line it is distinguished by its retro accents and classic lines. The chronograph and tachymeter functions and specially crafted hands featuring the Cobra logo make this an unmistakable racing watch. The unique blue-colored dials are the famous Shelby® Cobra Guardsman Blue and feature double racing stripes as an accent. Finally, the special hours and minutes hands are designed in the shape of the Cobra steering wheel, and as a finishing touch, the back of the watch is engraved with the collection title and Carroll Shelby’s own signature. 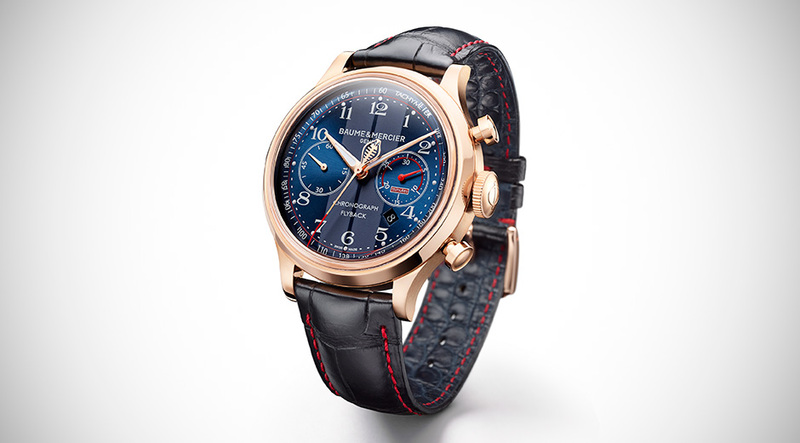 The steel Capeland Shelby® Cobra chronograph is limited to a quantity of just 1,965 pieces paying homage to the year Carroll Shelby won the championship. it retails for $4,450. The 18k red gold model is limited to just 98 pieces, in tribute to Carroll Shelby’s own Cobra racing number and retails for $19,950. Each timepiece in the Capeland Shelby® Cobra collection is designed to capture the spirit and power of Cobra and they do it amazingly well. Now just in time for christmas Baume Mercier is releasing just one more variation on the Cobra Chronograph… Literally just one! Taking off from the design of the two previous iterations, Baume & Mercier has designed a truly unique version of this watch inspired by the graphic identity codes of the Shelby Cobra racecar. 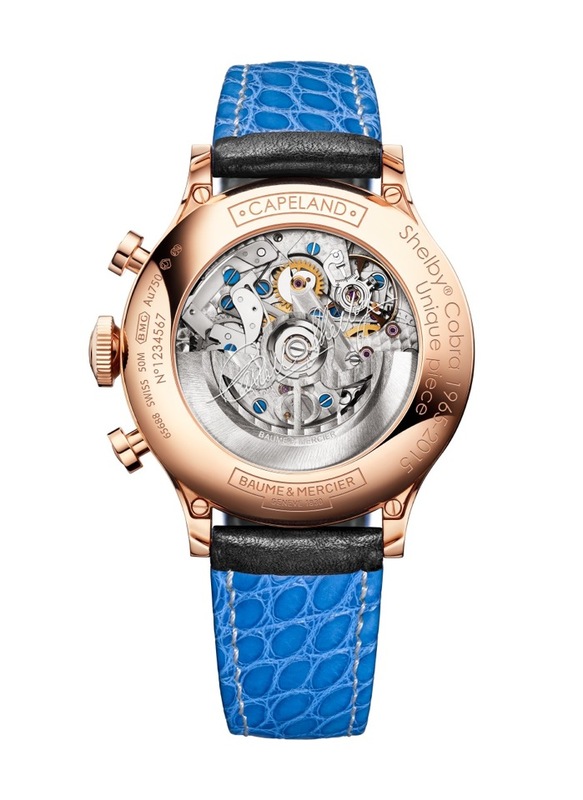 This version features a striking off-white dial with sky blue stripes, blue accents on the dial and hands, a 44 mm polished/satin-finished 18K red gold case, a finely grained black calfskin strap with round-scale blue alligator lining and gray stitching, and an 18K red gold pin buckle. The case back is specially engraved reading: Shelby Cobra 1965-2015, Unique Piece, and has Carroll Shelby’s Signature. Another distinction between this version and the previous is the movement, this flyback chronograph is driven by a Swiss-made mechanical self-winding movement from the Manufacture La Joux-Perret. All of this comes in a beautiful box with an additional black leather alligator strap with round-scale blue alligator lining and gray stitching. As I said there is only one of these and it is being auctioned by Antiquorum December 15th in New York with the proceeds going to the Carroll Shelby Foundation, an organization that raises funds to help families and children affected by heart diseases. It also provides schooling and education for underprivileged young people in the US. 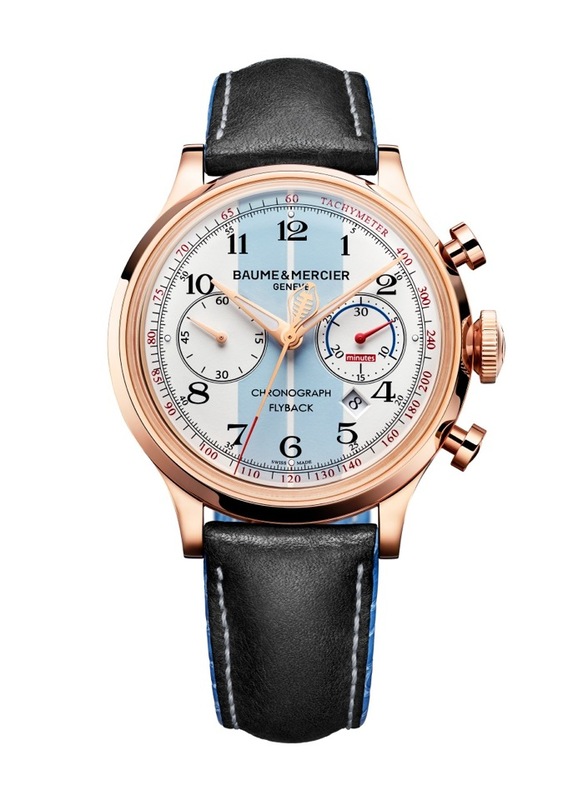 Baume & Mercier will produce only one exemplar of this significant collector’s piece. The highest bidder in the auction will also receive an exclusive VIP package experience, valued at $10,000. 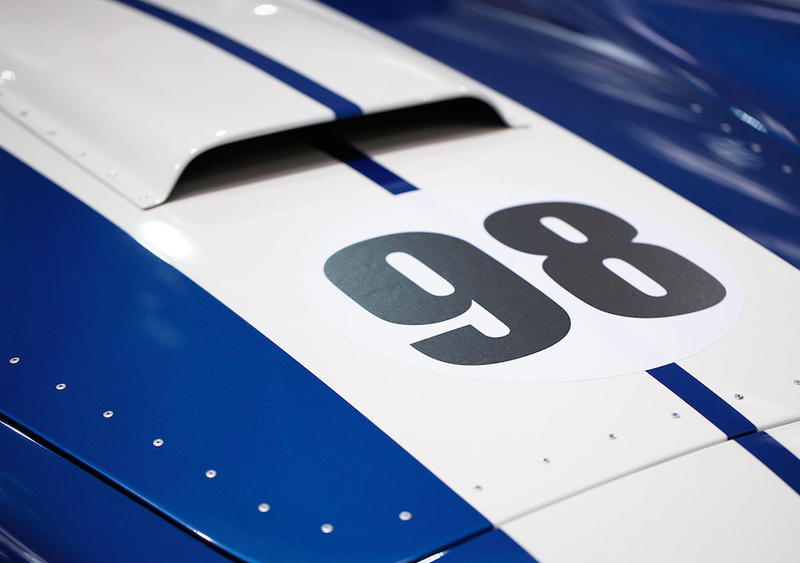 It includes a visit to the Shelby World Headquarters in Las Vegas, an original illustration of the Cobra signed by the Cobra driving legends, a Cobra driving experience, two custom-made racing suits, a VIP factory tour, a personal item of Carroll Shelby and a photo opportunity aboard an historical Cobra CXS2000. For more information or to register for the auction, visit www.antiquorum.com. 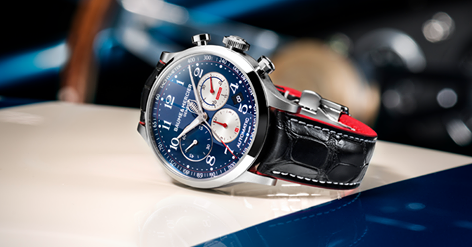 To view the Baume & Mercier Capeland Shelby® Cobra Collection as well as current styles, please visit www.baume-et-mercier.com. Celebrating such moments has been Baume & Mercier mantra since its founding in 1830, and what a moment to celebrate. An anniversary of an automotive legend, both the man and the machine. A celebration all in an effort to help those in need and during the holiday season. I couldn’t think of a way for them to do all of this that could possibly be more swell. This entry was posted in Baume et Mercier, How to live and tagged Antiquorum, auction, automatic, Baume at Mercier, Baume Mercier, Carroll Shelby, Cobra, Fluback, flyback chronograph, horology, La Joux-Perret, review, Valjoux, Watches. Bookmark the permalink.